A collection of five brief miniatures for piano; rather tuneful, defined by a “minimal” and generally consonant feeling. Between Gershwin and improvisation, between the serious and the ironic; Debussy challenging the young virtuosos to a duel, Kayn looking down from above. Bohème and total detachment live together inside a sound reminiscent of an ancient radio broadcast, charming and full of nostalgia. Music characterized by an undeniable, profound fascination. Dissonance approaching the limits of total improvisation; the piano is mainly utilized like a percussion. 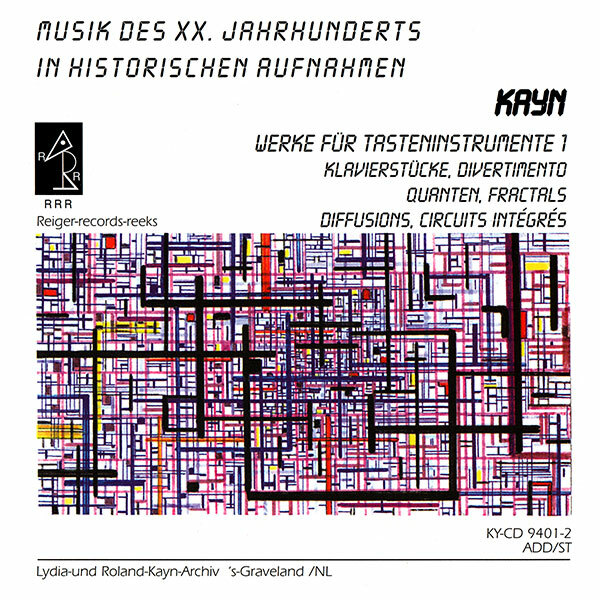 Nervous, unclassifiable music: almost a gesture of rebellion or disdain, whose technical aspects are not too distant from those discernible in Cecil Taylor and Keith Tippett’s work. Recovery of a few tonal centers fully established but, at the same time, decidedly fluctuating. Harsh evolutions accompanied by inscrutable reverberations and cascading arpeggios; alternately pseudo-consonant and radical, with additional Debussy-esque shades. Ethereal perfumes and the acrid smell of clusters go hand in hand in a composition that, if listened at low volume, becomes nebulous and immovable, establishing a quiet continuity only rarely interrupted by a change in the overall dynamics. This version – twice as long compared to the first one – is notable for an electronic treatment (perhaps a ring modulator?) producing a distorted sound. The sense of opposition to the aesthetics of “nice writing” remains intact. After the tenth minute, the sound becomes similar to that of a harpsichord brought to saturation. For 1 to 4 electric organs. The “cybernetic spirit” begins to emerge quite distinctly; the interaction between the manual aspect (a continuous evolution of held, repeated and superimposed chords) and the sound-altering electronic apparatus gives birth to a fluorescent harmonious liquid similar to an ebullient magma. Sidereal abysses and extreme emotional moments are achieved, without a chance to accurately describe anything. For 1 to 4 pianos. Inevitably one thinks of a merger between “Quanten” and “Diffusions”. Dissonant heaps and hues derived from harmonic distortion contribute to a form of “lucid abstractionism” not comparable to anything from the 20th century. Frequently, moments of silence and stasis pave the way for investigations of timbre and percussiveness, particularly in the medium-to-low range. Amazingly, in different sections of the piece the electronic modifications conceived in the studio evoke the sonorities of a prepared piano. Even here, among the various asperities, a distant celestial reverberation is perceived time and again.